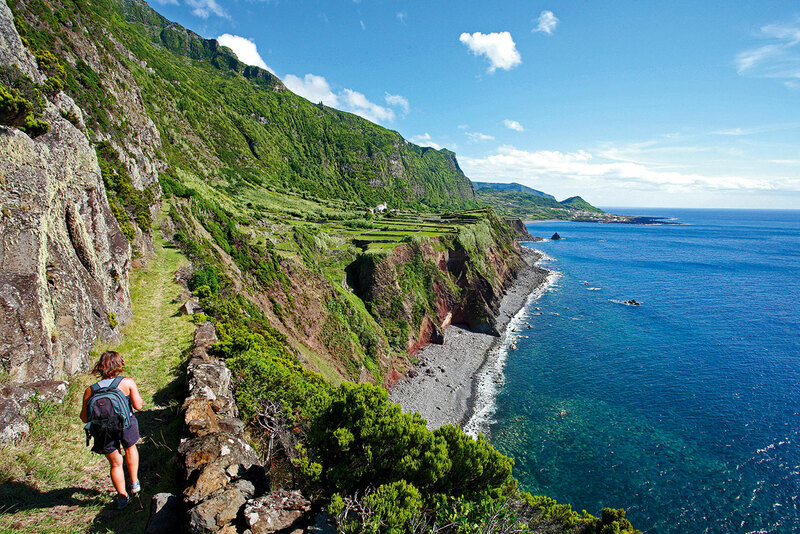 The walking trail of Salto do Cabrito is a small circular route beginning/ending in the area of Caldeiras of Ribeira Grande. Here you can enjoy the hot springs, the recreation area as well as the bathing facilities and restaurant. Begin this walk going down the tarmac road until you reach the junction and follow on the left, direction Lombadas/Monte Escuro until you find a pipeline. Continue the tarmac road, around 100m and you will find, on your right hand side, a chain that you should transpose and follow along the way to gain access to the Fajã do Redondo Dam. Take the same road back until the same pipeline and follow now the land road ahead of you. Around 500m ahead, you should turn left, go around a gate (closed) on your left. This downward road, flanked by Japanese cedars, will take you to the Hydroelectric Power plant of Fajã do Redondo, deactivated, but you can visit if you call in advance the Company EDA Renováveis. In this location you will have to cross a stream, climbing the stairs that give access to a metallic sidewalk. This trail goes along the passageway until you find a steeply stairway that will take you to the Hydroelectric Power Plant of Salto do Cabrito. Arriving here, you will have to go right, round the building in order to gaze the waterfall that gives name to this power plant. 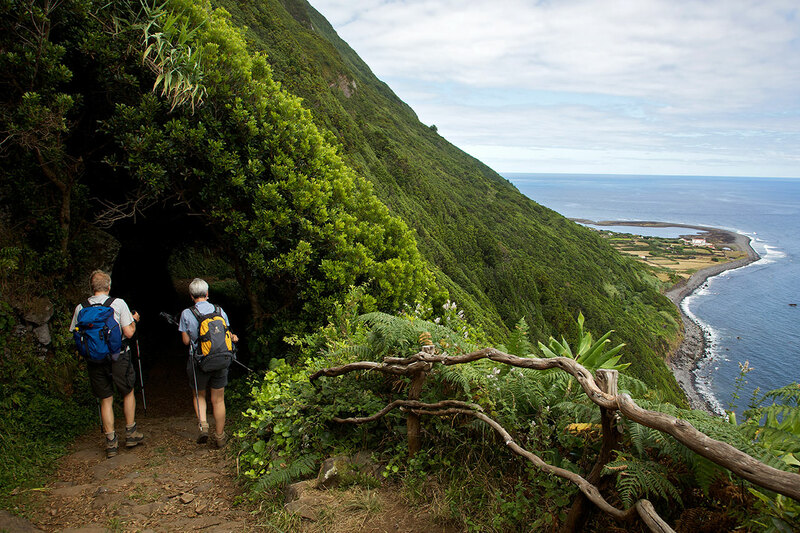 With the waterfall on your back, continue your walk going up until you arrive to a tarmac road. 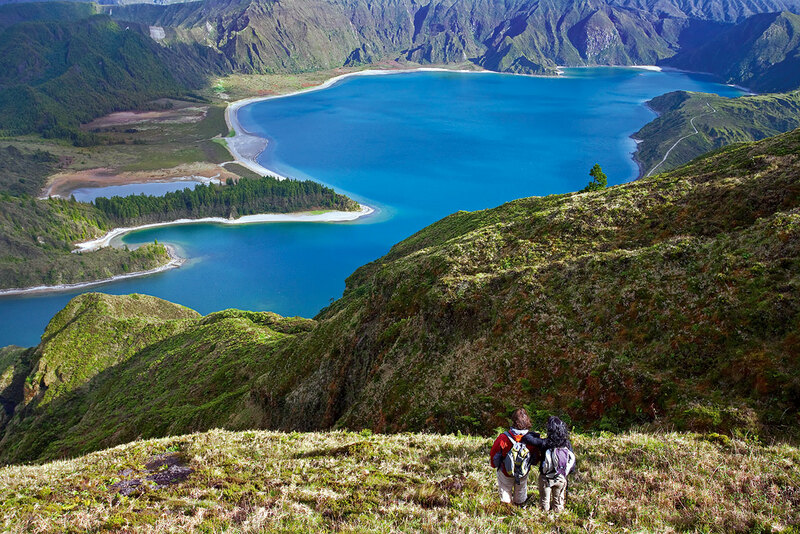 Turn right, following the sidewalk, you will pass the Bar “Lagoa do Fogo” and the Geothermic central of Pico Vermelho. Before the junction on your left side, you will find a detour on your right hand side, a dirt road and you should follow it. Here you have to overcome two streams, the second one with bigger flow, being advisable to cross it barefooted. Ahead you will find a fork, go right, cutting on your first on your left side. Follow the signs until you see a paved road where you should turn right again, back to the Caldeiras of Ribeira Grande.